Share Certificates in BCIT have been issued to TD Ameritrade, Etrade, Scottrade, Schwab & TD Waterhouse Canada as a gesture of goodwill by BCIT to help the recipients in their dealings with customers who are BCIT Investors. 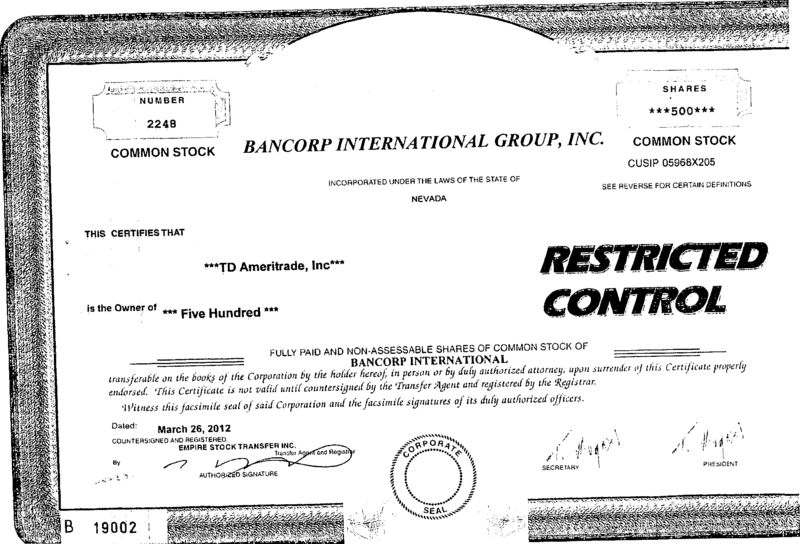 Bancorp International Group Inc (BCIT) is a Nevada registered company. Standard & Poors Global Cusip Services state that the correct and active cusip for BCIT is 05968X205. 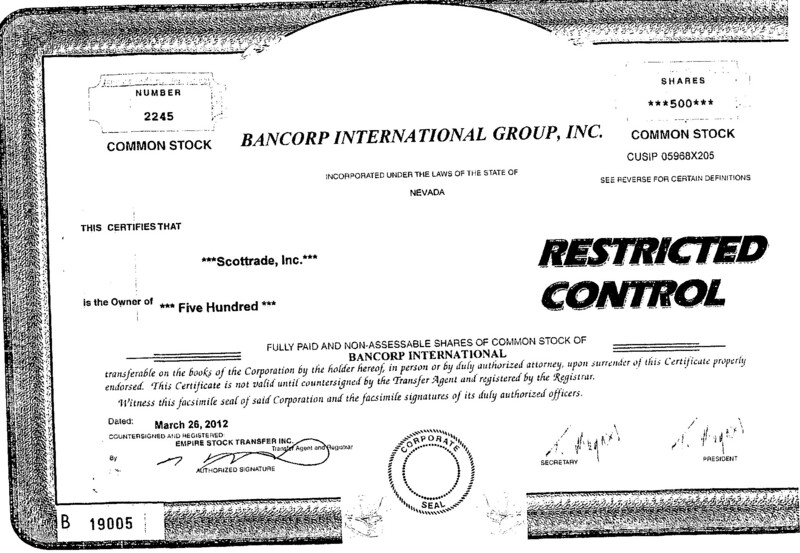 Over the last few years and especially the last few months BCIT Investors have been asking various brokerage firms for certificates for the stock they bought in 2005. There have been some confused messages given to investors both by participants and even the SEC about BCIT company information. Despite the fact that the correct and active cusip number for BCIT is 05968X205 many firms are using Cusip 05968X106 which Standard & Poors Global Cusip Services confirm has been inactive since January 9, 2006. 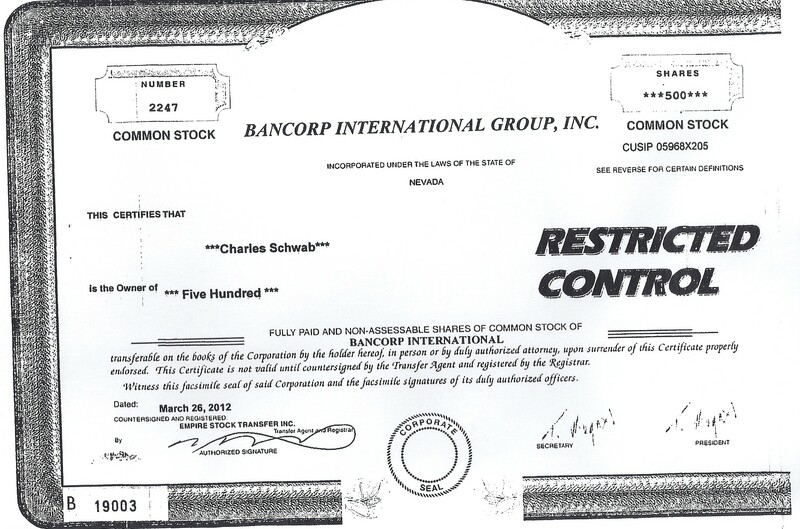 As a gesture of goodwill and in order to help various customer service teams communicate accurate and correct information about Bancorp and its stock to investors, the company has issued each of the following brokerages a certificate for 500 shares: TD Ameritrade, Etrade, Charles Schwab, Scottarde and TD Waterhouse (Canada). 1. 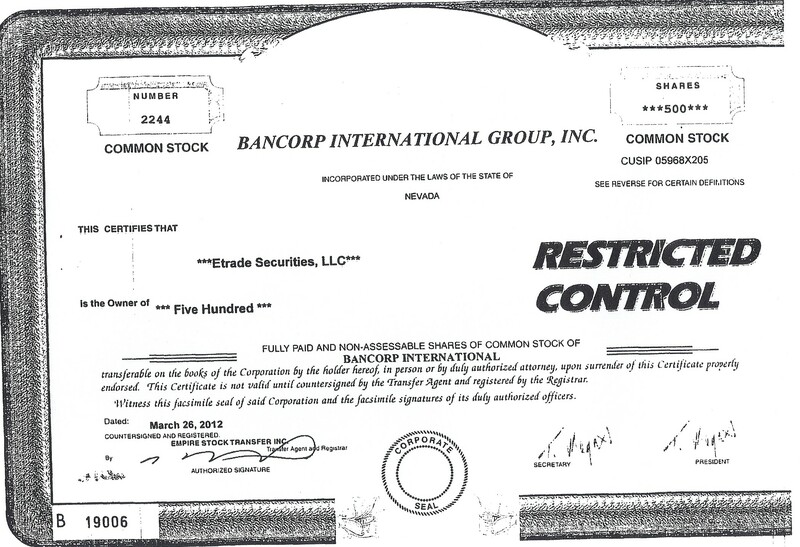 The name of the issuing company on the certificate is Bancorp International Group Inc NOT Energy Source. 3. 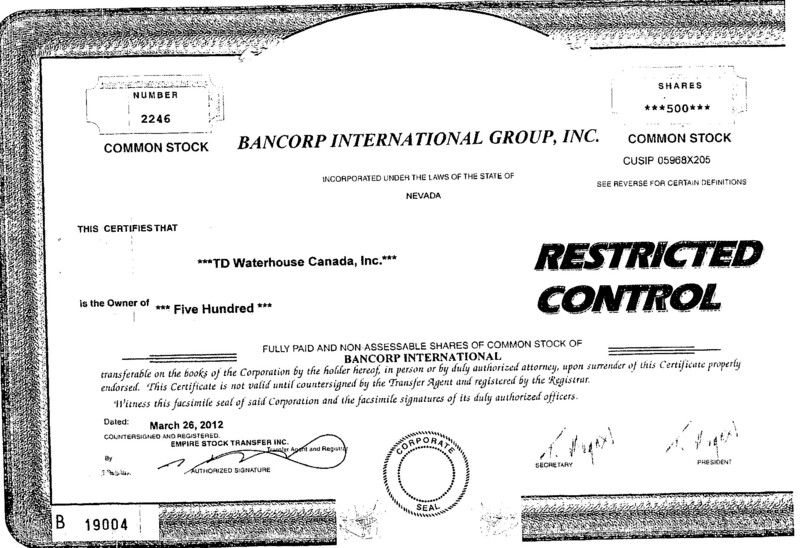 Paper certificates do still exist and can be obtained for BCIT stock. The certificates were cut and delivered to the recipients by the company the Transfer Agent, EMPIRE STOCK TRANSFER. It is sincerely hoped that this course of action will promote a better understanding by participants of BCIT and prevent any further erroneous information being communicated to investors.